The flow of migrants coming to Europe from Africa is likely to grow in the coming years, writes Sputnik Germany contributor Bernhard Schwarz. For decades Libya served as a firewall halting the tide of refugees heading to the EU. Now when Libya lies in ruins European leaders see that late Colonel Muammar Gaddafi was right, Schwarz stressed. Former Libyan leader Muammar Gaddafi's "prophecy" is turning into reality with destitute Africans violently storming the Spanish-Moroccan border on July 26, writes Sputnik Germany contributor Bernhard Schwarz, stressing that the event sends a strong signal to Berlin. "Driven by desperation and hunger, they are ready to risk their own lives and the lives of border guards to get to Europe. They will not take no for an answer. Their brutality against the police is shocking and should set the alarm bells ringing for Brussels. So far, the EU has not reacted to the incident, but unless a concrete action plan is presented soon, there is a risk that damaging violence and anarchy will be at the heart of Europe," the German journalist warned. 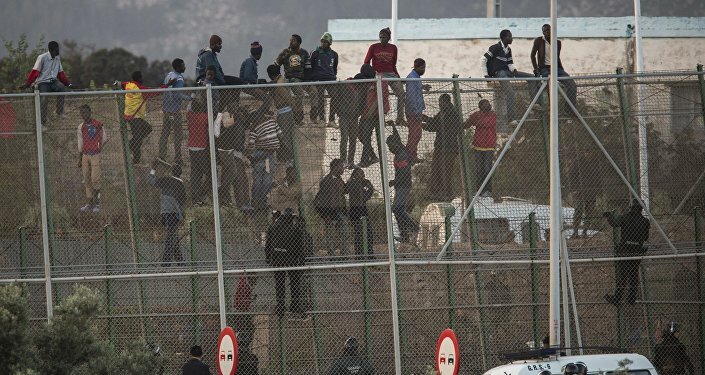 On July 26, 800 migrants from Africa stormed a seven-meter high fence separating Morocco from Spain in an attempt to cross the border between Morocco and the Spanish enclave of Ceuta with 602 migrants making it onto Spanish soil. The migrants threw stones, sticks, Molotov cocktails, feces and hashish at law enforcement officers. The assault resulted in 132 migrants and 15 police officers being hurt. The International Organization for Migration earlier reported that since the beginning of the year 3,125 African nationals had crossed the Spanish border through the enclaves of Melilla and Ceuta and entered the EU. "Now listen, you people of NATO," Gaddafi said on the eve of NATO's invasion of Libya in 2011. "You're bombing a wall which stood in the way of African migration to Europe and in the way of al-Qaeda terrorists. This wall was Libya. You're breaking it." Libya has ended up as a failed state ruled by two governments which have yet to establish law and order in the country. Predictably, Libyan rebels did not return to their patron the weapons, generously provided to them by France and the US. Additionally, Gaddafi's arms stocks were looted turning Libya into one of the largest black markets for weapons. "A similar situation could be observed after the American intervention in Iraq, Afghanistan, and also in Syria before Russia stepped in there [in 2015]," Schwarz pointed out, stressing that most asylum applications are coming to Germany from the aforementioned countries. 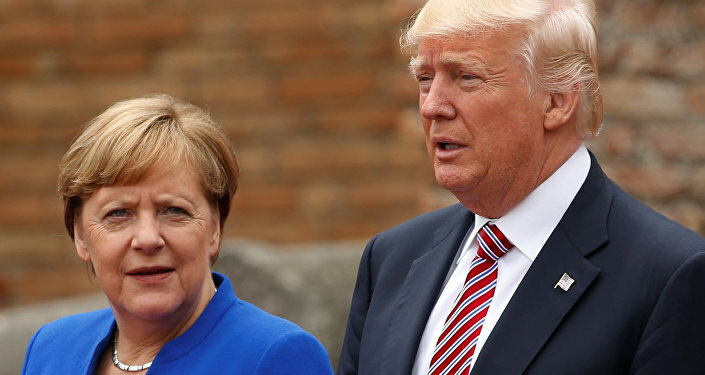 He remarked, however, that German Chancellor Angela Merkel's approach to the refugee problem evokes strong memories of the helplessness of the Roman Empire shortly before its fall, adding that the chancellor's policies differ a lot from those of her predecessors, Willy Brandt, who served as chancellor of the Federal Republic of Germany from 1969 to 1974 and Helmut Schmidt who occupied this position from 1974 to 1982. Both Brandt and Schmidt warned against unregulated migration saying that it would not be without grave consequences for German society. Currently, about 10.6 million foreigners live in Germany, while refugees continue to arrive in the country. To tackle the migration crisis German Interior Minister Horst Seehofer presented a plan envisaging the creation of special centers and conducting necessary procedures to slow down the refugee tide. In early July, Seehofer and Merkel agreed to accelerate the return of migrants to the countries where they initially applied for asylum. Meanwhile, Bavarian police began patrolling the German-Austrian borderon July 18 to prevent illegal entries. Commenting on Seehofer's plan to turn migrants away to where their demand was registered, Schwarz referred to the recent incident on the Spanish-Morocco border. "After the storming of the Spanish enclave of Ceuta, the question arises — how these centers should work and how they should be protected. The population of Africa is growing rapidly; by 2050 it will grow twice to 2.5 billion. The flow of refugees is likely to grow due to hunger, poor economic conditions, corruption and lack of prospects for the population. It is very probable that the refugees won't be stopped by a rejection of their application and will try to enter Europe," the German journalist opined. He pointed out that over 75 percent of refugees heading to Europe by sea come from Libyan ports, first of all these are the inhabitants of Niger, Eritrea, Somalia and Chad. According to Schwarz, Syria may emerge as an example of how the migration problem could be solved: Following Russia's involvement, the legitimate government of Bashar al-Assad is gradually restoring order in the country which facilitates the return of Syrian asylum seekers from Turkey, Lebanon and Jordan. That means that Syria won't repeat the fate of Libya and will reduce the flow of Syrian nationals seeking asylum in Europe. EN NOTRE NOM…Jusqu’à quand abuserons-nous de notre innocence ?